The Engaging People Company has joined up with Social Routes to launch Route to Engagement, an approach which will help companies to improve employee engagement and increase satisfaction. Step 1: Define brief Understand purpose and strategic aims. Step 2: Survey An inclusive and engaging employee survey. Step 3: Workshops Employee workshops based upon the themes emerging in Step 2. 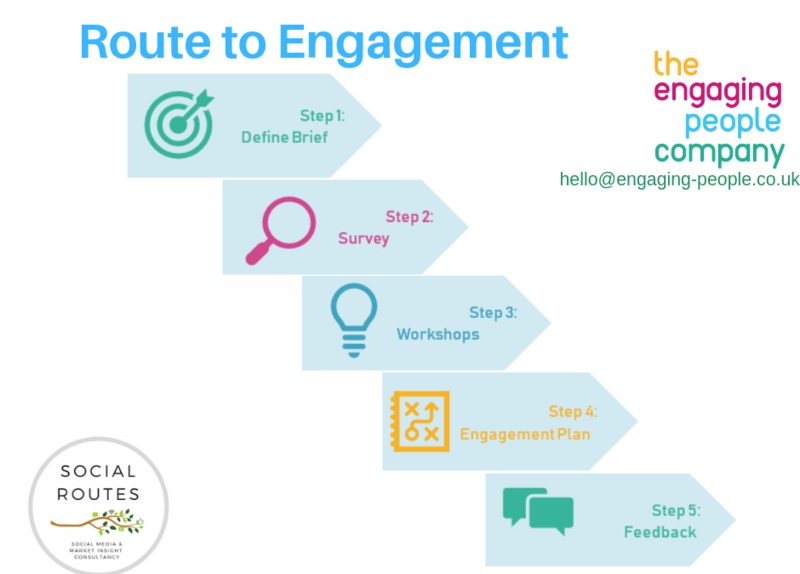 Step 4: Engagement Plan A targeted, meaningful and deliverable plan to improve engagement. Step 5: Feedback Employee feedback and communications based on the findings. More details are available in the leaflet below or contact Michelle Gant michelle@engaging-people.co.uk or 07834 578872.